Solomon Ternder's Blog: HAPPY EASTER! Solomon Ternder's Blog. Learn about Amazon kindle/paper back publishing. 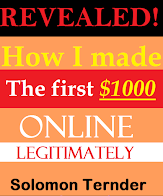 Read about my successes and failures online and get motivated to succeed in your online business. He was cursed so I can be blessed! and now reign in life. far above principalities and powers.